Budokan, Tokyo, Japan 13th & 14th March 1984. Japan tour of RAINBOW is, a total of six times, starting in the first visit to Japan that is associated with the “RISING” of 1976 have been made. In his visit to Japan, live in Tokyo Nippon Budokan is there always a special position. Especially Budokan performances in took place in March 1984 “BENT OUT OF SHAPE” is, there is also the presence of the director and the official video by the orchestra participation, it has left a strong impression on the fans. The 1984 Budokan performances, “final performance” of March 14, in addition to March 13 of the first day also, a number of audience recording far have been excavated. They are I have the presence of all for the fans is said to be important and only one. Among these titles mentioned here also in a variety of recording, is an item to relive live in particularly good sound. 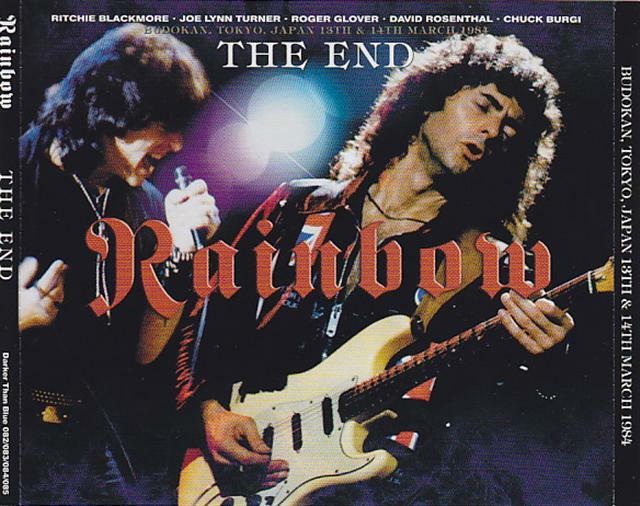 This work “THE END” is intended to the 2Days of March 1984, which became the last Live title exactly RAINBOW in Tokyo Nippon Budokan, it was packaged into four press CD with excellent audience recording. The direct use of the original cassette master also was not known at all between the traders to it. A special live for the fans, you are allowed to relive a time in the great sound and vivid. This Budokan performances sometimes “final performance” is the official video of the fan you might you think that the “already understand the contents.” But the edited video work, comparing the play-by-play record of matches without false the live of full-length, scene, such as did not know until now comes out a number. Precisely because this Budokan 2Days is a special live, we like to know at the appearance of truth. This work will be and the best guidance. In the disk 1 and 2, it recorded the stage of March 13, which was the first day Budokan. Here we are using a surprisingly excellent audience master, you will receive even impression of sound board sound source is a little listened felt. Among them, the finest of clearness and the guitar sound of Richie, housed in the direct sense of the wonderful word, from the “Spotlight Kid” of the opening, a veteran of mania also would not be prohibited from surprise. 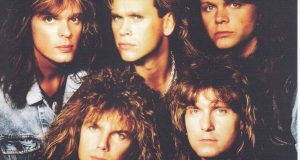 “Spotlight Kid”, “Miss Mistreated” and “I Surrender,” “Can not Happen Here” and flowing live the first half of the configuration is the same as for 1982, but Joe Lynn Turner of the vocal Ya, which has made more growth David Rosenthal of the keyboard, such as the newly added Chuck Vaghi of drums, taste of playing is clearly higher than the previous year. Also Richie guitar to give the excellent members increased shine and let everywhere in the hear the great play. because the next day there was a video shoot, the band seems to have been aware of the overall solid play, but this day there is a abandon of in a good way on the contrary, I will not listen to the unique performance. Especially Joe if think that the “Can not Happen Here” and “Fool For The Night” in or showed off the intro only by vocals, in the second half, “Catch The Rainbow” and shows off the impressive singing. The Ritchie also to hear the “Street Of Dreams” In guitar solo that was unusual, “Blues” in the second half I will showcase also exquisite negotiations and Rosenthal. It includes the second half live “Woman From Tokyo”, “Stranded” (Richie from this area is really amazing! ), It has not been played “Stone Cold”, and does not attach listening office the next day. “Since You Been Gone” from the “Smoke On The Water” is also impressive. It can be found in the recording that said to perfection to “Over The Rainbow” is the last in this work. Are recorded in clear surprisingly until further announcement venue after the show, the fans last until the end, should become listened to the recording while crossing the thoughts of excitement and surprise. a pattern of following the disk 3, 4 “final performance” and March 14 has become, here also has recorded with good audience recording. When compared too was great disk 1 and 2 and, there is the impression that cede one step in terms of sound quality, but (this is too wonderful the target of comparison), with more than enough of quality as audience recording of the time, here also press CD reduction will say that it is convinced of the sound. Because as mentioned above this day video shooting has been performed, the band from the play felt abandon in a good sense of the day before, was a tight totally solid, it seems to try to play a cohesive. The goodness of unity is also a sense of stability of this recording engagement, we will entertain a pattern of live slowly and carefully. This recording with such songs and between Angkor break that has been cut in the official video, not listen to the big feature to be exhaustive the whole picture of live. “Spotlight Kid” live the first half beginning with, “Street Of Dreams” and “Fool For The Night” and the like, but until the mid-live the new song is taken up is the day before the same set list, and the day before neat playing there was also wild side It will entertain the difference of. Large listening stations of this live would be a still orchestra participated “Difficult To Cure”. The first half of the “ninth” fourth movement, boldly the orchestral parts to enter the “Ode to Joy”, and effectively featuring configuration does not have a wonderful and so say only. The Rosenthal of ability who arrange this it will be allowed to easy. Also thrilling itself deployment since the beginning of the drum. This is in the fusion of hard rock and classic, you will say that one of the ideal form-successful example. 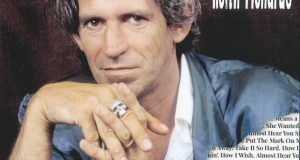 “Stranded” in the second half live, although the day before the “Woman From Tokyo” has been inserted, this day has built-in “Hey Joe”. Its “Woman From Tokyo” becomes the pair as “All Night Long”, it is greatly boost the live highlights. In was the last performance for the RAINBOW “Smoke On The Water”, Live will celebrate the excitement of the finale. “Over The Rainbow” in the last in the present recording also firmly be confirmed (for video and unreleased), also has the highest value as a document of the venue. 2 This work extends to four hours by adding the performance lets you relive the ideal form the live which RAINBOW is showed at the end. Realism and air feeling that did not taste in the video, Please enjoy in this work. And to taste the culmination of Joe Lynn Turner era by a single, it is unprecedented item! In reunion before the Rainbow last Japan tour that took place in March 1984, it became the final performance. Press CD set was recorded stage in Tokyo 13 days and 14 days. First, Tokyo performances, the first day of the stage, especially in the guitar, has been recorded with good sound quality clear. Decorate the opening Richie from “Spotlight Kid” is the best glue, than the solo is playing tightly original, and such determine the arming in backing, are earnestly skip. The highlight of the day will from the “Stranded” in the second half. And Ritchie seems to core fans to play off slightly to take a trill and rhythm are not tears of gratitude definitely do not play the riff in the intro. And Richie is not played in Japan performances of the previous year (1982) from the “Blues”, it is expected was disappointed fans “Death Alley Driver”, is played in thrilling. Splendor of the guitar solo feel the formal beauty of Richie, not the use of representation. Encore, the audience chorus wrap the venue “Smoke On The Water” has graced the last. stage of the Rainbow last stage and became Japan final performance 14th, compared with 13, some sound quality is falling, but still recorded in a good audience recording. 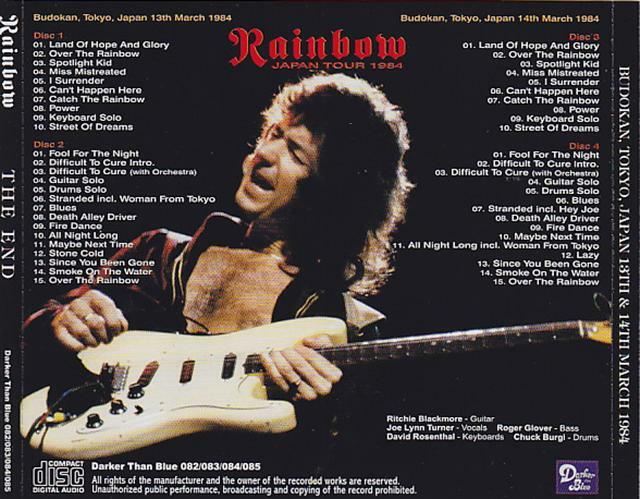 On this day it must have been aware that it is the last stage of the Rainbow Ritchie, glue also seems to be more than the day before, but makes us hear the great play, the shooting of live video, which was released after the consciousness It was whether to, nor not feel the neat of play compared with the previous day’s rough is. Co-star of the previous day as well the deep since purple in the “Difficult To Cure” orchestra, compared to the days of Deep Purple, it can be confirmed that the fusion of rock and classic became more natural. Stage of the day, at that time, and since it was released on video tape and laser disc in the official, but can be seen in the video,, including the realism of the venue, and the listen to realistic, at that time, said to watch there will be something emotional is for the fans.